A video presentation of the vision was shared with Christians from all sectors of the metro at a “Praying For the City” gathering at the Feather Market Centre on Sunday (December 9). The video, narrated by Pastor Afrika Mhlophe, says the city’s problems are like those that Nehemiah faced (Nehemiah 2:15-18) and can be turned around by united Christian action. The vision came about through a process in which church leaders representative of the Body of Christ in NMB have invested time in praying together and building relationships. Church unity is identified as the foundation of the proposed Nehemiah wall to be built around the city. The first layer of bricks is the metro’s 60 municipal wards. The next eight are the domains of church, business, education, government and NGOs, family,media and communication, arts and entertainment, and sport. 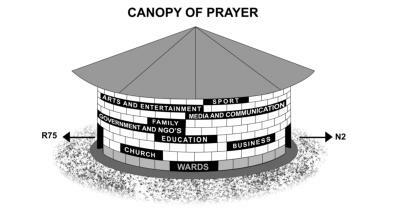 Finally, the walled city is to be covered by a canopy of prayer. The video presentation spells out a strategy for turning the vision into a reality by appointing a ‘person of peace’ in each ward to mobilise united action involving all churches and every person in the city. The vision will be driven by a Nehemiah Network comprising 60 ‘people of peace’ and a further 480 ‘people of peace’ across each domain in the 60 wards. Deputy Executive Mayor, Nancy Sihlwayi addressing the prayer gathering. Echoing the vision’s call for the destruction of the sacred/secular divide in the minds of Christians, Pastor Neville Goldman, who addressed the prayer gathering, repeatedly said it was ‘time for the church to move out of the building’ and participate in providing solutions to everyday community needs. Deputy Executive Mayor, Nancy Sihlwayi, told the gathering that she welcomed church initiatives to contribute to the restoration of the city. 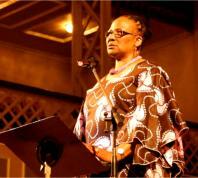 She apologised for poor service delivery by the municipality as a result of “many personal agendas”.